In heavy 3-quart saucepan, cook beef and onion over medium-high heat 5 to 7 minutes, stirring occasionally, until beef is thoroughly cooked; drain. Stir in remaining ingredients except cheese and corn chips. Heat to boiling; reduce heat. Simmer uncovered 5 to 10 minutes, stirring occasionally, until corn is tender. Top individual servings with cheese and corn chips. 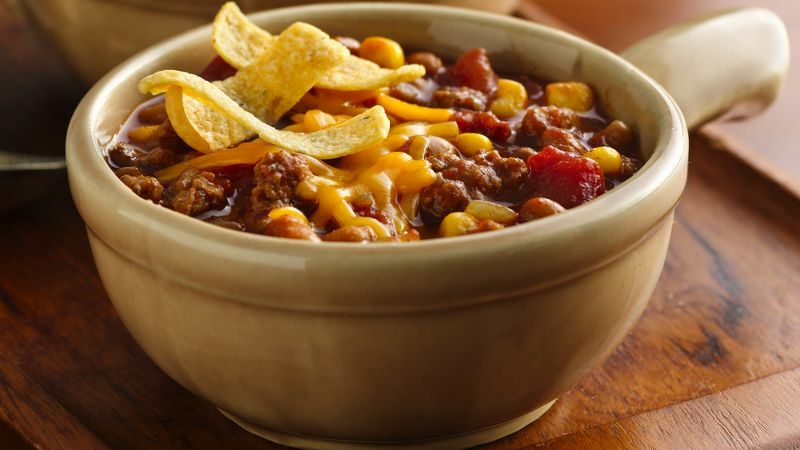 You can use any type of baked beans in this spicy chili that goes from start to finish in 30 minutes. Substitute fresh corn kernels for the frozen corn.